Finding the perfect wedding ring for yourself or your groom can be very difficult. 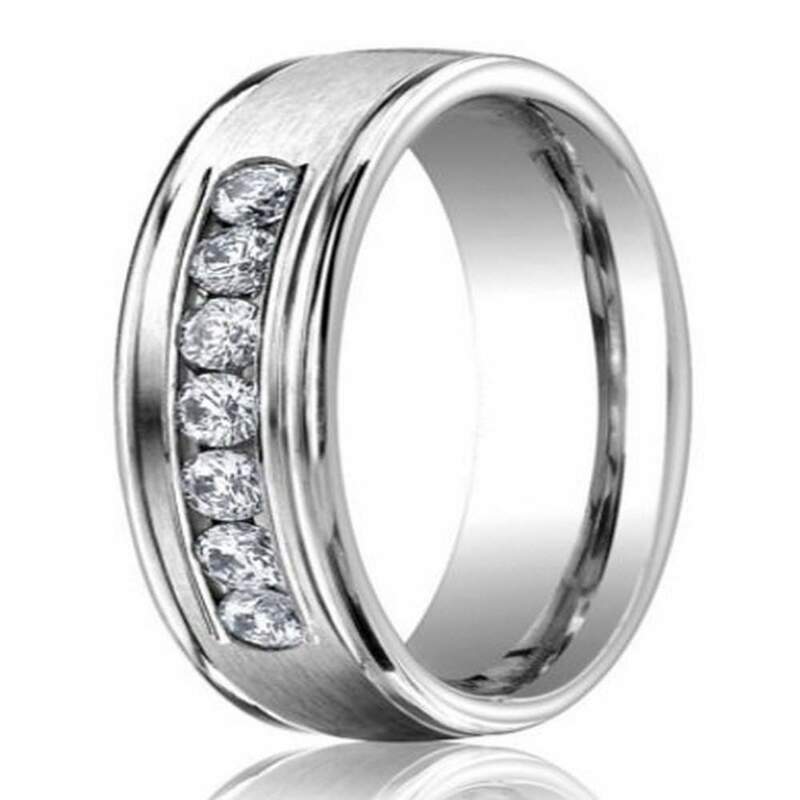 Luckily for you, we have combined all the wonderful characteristics of traditional and contemporary ring styles to create our 950-platinum men’s wedding ring with diamonds. On the cutting edge of fashion and jewelry, this signature ring is sure to turn some heads. From its classic satin finish to its polished round edges, you will feel confident and tasteful while wearing this wedding band. Diamonds are much more than a dazzling accent in women’s jewelry. Diamonds represent strength and tenacity. Celebrate the commitment of a lifetime by discovering the wonderful traits of our 6mm men’s 950-platinum diamond wedding ring today! The pure beauty in our 950-platinum men’s wedding ring with diamonds is incomparable. The advantage to choosing such high-grade platinum is that your wedding band will be better for you overall. Platinum is one of the most popular metals for rings because it is hypoallergenic, durable, and it fails to add any color reflection in diamonds, which is why it pairs nicely with the total carat weight of 0.42 featured in our 6mm men’s 950-platinum diamond wedding ring. As you enjoy the beloved white sheen, you may also find that the patina formed from surface scratches throughout time delivers a highly desirable look to be treasured for years and years to come. If you or your groom have settled on platinum, browse our fine selection today and learn more about our personalized engraving services! Attractive, high quality, very good price.